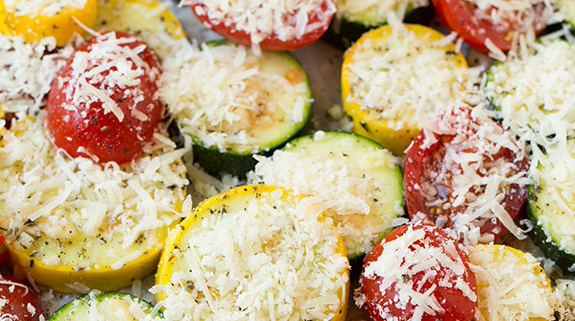 Ah, summer squash. Which variety is your favorite? Capitalize on the ease and speed of this side dish that’s good for most restricted diets. I won’t specify ingredient amounts, but a rule of thumb is one 6″ squash per adult eater. Preheat oven to 400° F and butter or oil a baking sheet. 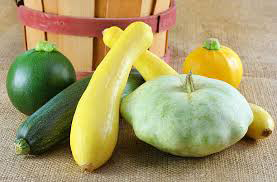 summer squash in 3/8 – 1/2 inch “coins.” Mix varieties for color or limit yourself to a single variety. oregano, basil, and thyme; garam masala and curry or smoked paprika; dill; epazote; or any other fun combination of herbs and spices. Fresh herbs are great. Spread squash coins in a single layer on baking sheet. Spray or drizzle with oil. 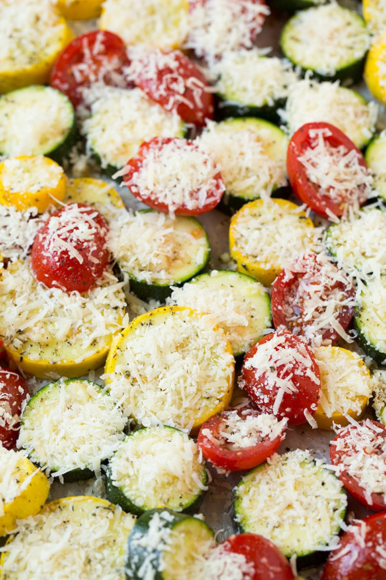 Mix garlic, herbs, salt, pepper, and cheese and sprinkle evenly over squash. Roast on middle rack 25 – 30 minutes. Garnish. This recipe probably would be wonderful grilled. Since we don’t have a barbecue, I’ll wait to hear others’ comments on grilling.